With this mobile you can capture the beautiful music made by the breeze. 1. Start with the disk which is to go on the top; drill holes if there are none. Make sure you have the same number of holes on the top and tubes. If not you can make a long string with beads. I had to do that as I had 5 tubes and 6 holes. Decorate the disks to make them more Elvish-looking. 2. Attach a string, about 40 -50 cm, in one of the holes. String beads on it and attach the tube when you have reached a proper length. Make it as long as you want. 5. Hang it out in then wind, and listen. Or hang it in your room as decoration. 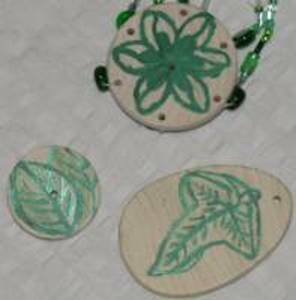 **For an Elvish style, decorate the wooden parts with paint of appropriate symbols. 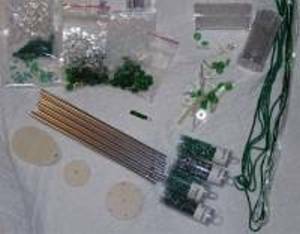 **Adjust the colors of the beads to room you are planning to have your mobile in. **To catch the wind properly, you will need a big piece at the bottom. **For different tones, make sure you find tubes of different length. I would not recommend that you cut the tubes yourself, as this will most likely make them very untuned.